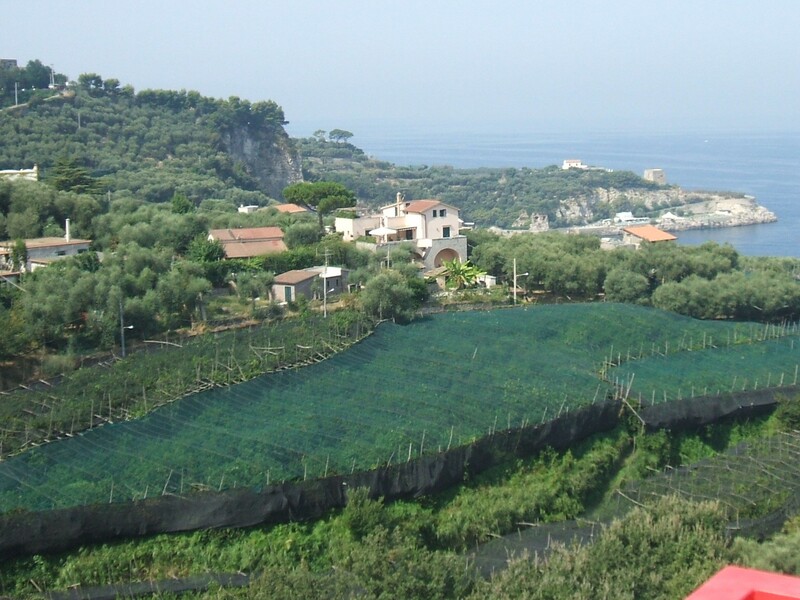 Only a few kilometres outside Sorrento, travelling south along the peninsula, you will come to the unspoilt little town of Massa Lubrense. 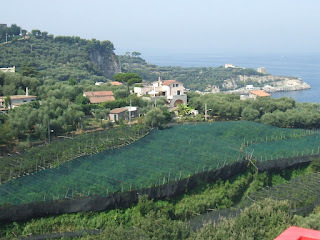 With stunning views of Capri across the bay, Massa Lubrense is a good starting point for some wonderful scenic walks along ancient footpaths where you will see Mediterranean plants such as myrtle, juniper and yellow broom growing. 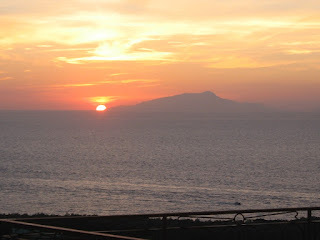 As the town is still not well known to tourists, the hotels and restaurants in Massa Lubrense tend to be less busy and less expensive than those in the centre of Sorrento. The local Linea A (Line A) buses operated by EAVBUS run all the way out to Massa Lubrense from Sorrento during the summer. 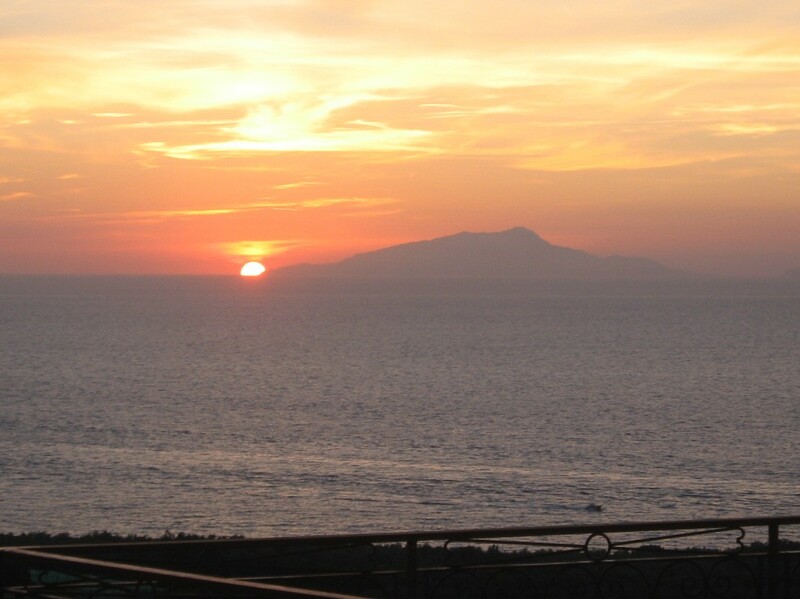 The Sita company, whose coaches connect Sorrento with resorts such as Positano and Amalfi further along the coast, have services that call at Massa Lubrense all the year round. The journey from Sorrento to Massa Lubrense’s main square takes about 15 minutes. 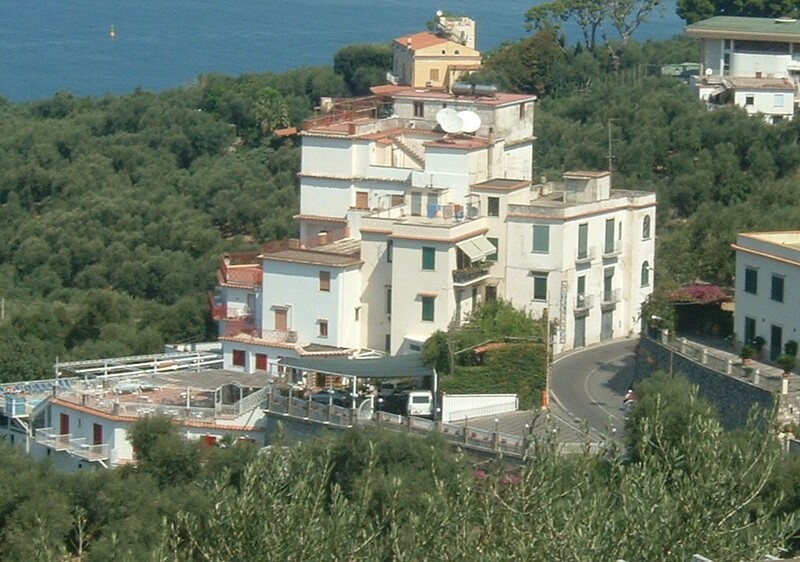 If you get off the bus in Largo Vescovado you will see a terrace at one end of the square from where you can look out over the sea and have a wonderful view of Capri. There are bars, restaurants and shops on three sides of the square. Massa Lubrense’s Ufficio Informazioni (Tourist Information Office) is on the same side as the church of Santa Maria delle Grazie. It is worth having a look inside this lovely old church, which was once the cathedral for the whole area. Building work began on the church in 1512. Although it was refurbished in the 18th century it has retained parts of its beautiful, original 16th century majolica floor. You can walk down to the sea along a winding road that will bring you out at the little fishing village of Marina della Lobra, where there are restaurants and bars, a stretch of beach and places where you can hire boats. A few buses run between Marina della Lobra and Massa Lubrense, but they are not frequent so check the timetable if you would prefer to ride back rather than walk. Two historic processions take place through the streets of Sorrento on Good Friday, which is known as Venerdi Santo in Italy. A white procession is held in the early hours of the morning and a black procession is held in the evening to mark the sorrow of the church for the passion and death of Jesus. The white procession represents Mary going out to search for her son. The black procession, in which a 16th century statue of the dead Christ is carried, represents Mary finding her crucified son. The people taking part wear hoods that completely cover their faces with just eye holes for them to see through, and carry crosses and torches to light their way. Thousands of onlookers line the route to watch the processions pass by, which are led by bands playing solemn music. 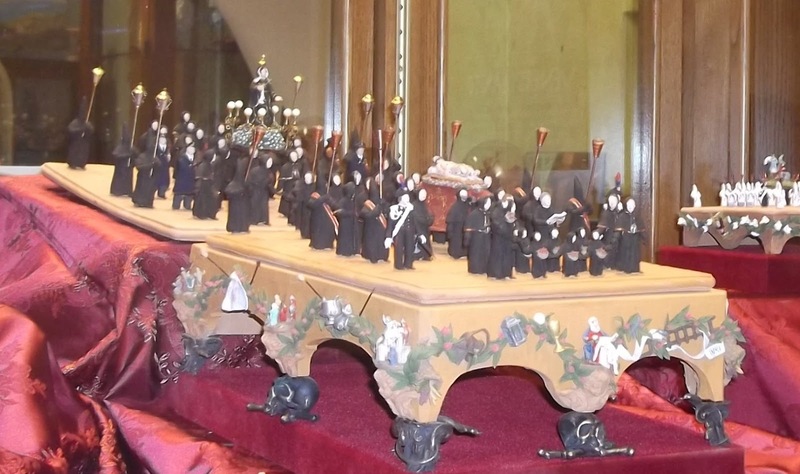 The processions are believed to date back as far as the 13th century when it was recorded that local friars went out on the night before Venerdi Santo dressed in sackcloth and bearing lighted torches to visit tombs in churches. 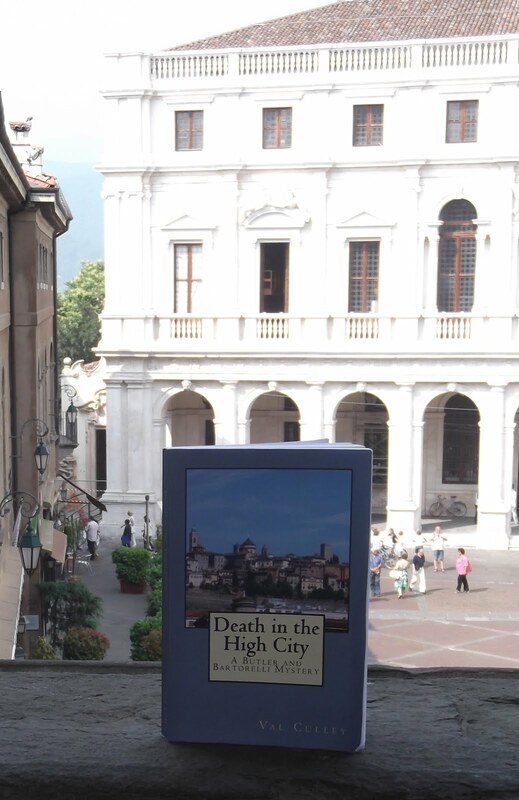 In the 16th century the procession began to take place on Venerdi Santo and involved the statue of the dead Christ being carried through the streets. The picture shows a shop window on Corso Italia in Sorrento which has a detailed model of the Good Friday processions on display. You are so close to the sea when you eat at Trattoria Da Emilia in Sorrento that the waves may occasionally splash your table. But a sprinkling of sea water is all part of the fun when you visit this friendly, family run restaurant down on the beach at Marina Grande. 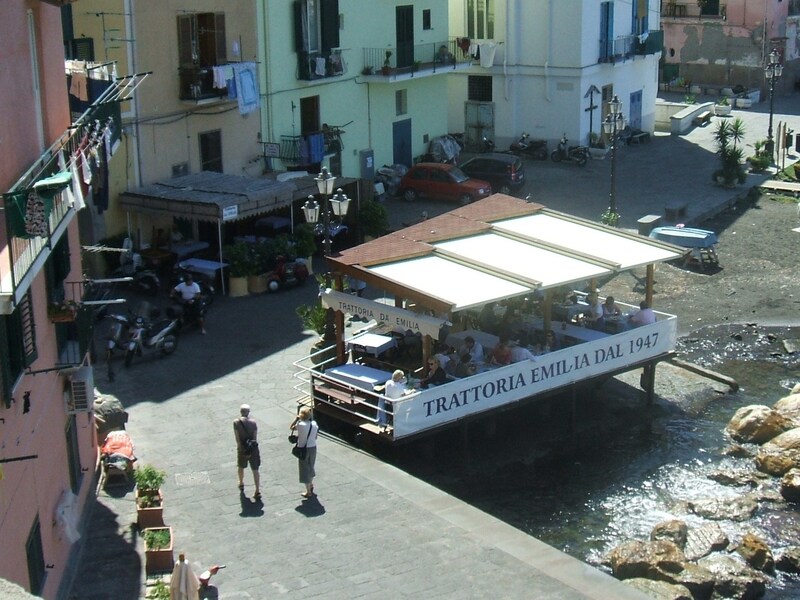 Da Emilia -- established 65 years ago in 1947 -- has an outside dining platform right at the water’s edge where you sit on wooden benches at tables covered with blue and white check table cloths. Order a jug of the delicious house wine while you make your choice as it is very good value. The menu is simple and, as you would expect, there is plenty of fresh fish on offer, as well as generous plates of antipasto, pasta and gnocchi. One of the restaurant’s specialities is gnocchi alla mamma, cooked alla sorrentina (sorrentine style) with tomatoes, cheese and basil. 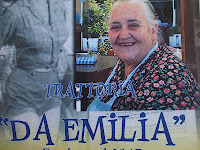 The mamma in this case is Emilia herself, the founder of the trattoria, who is pictured on the front of the menu. 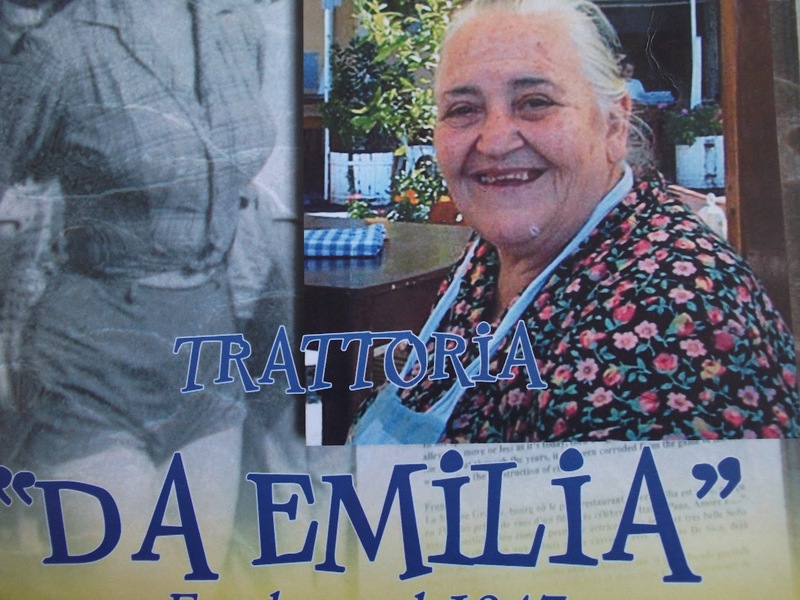 The restaurant is now in the capable hands of Emilia’s daughters and granddaughters, who continue to provide fast, but friendly, service. Trattoria Da Emilia in Via Marina Grande is closed on Tuesdays.